Thank you Madam President. I would like to thank the United States for its leadership of the council this month, and for organizing this very important debate. 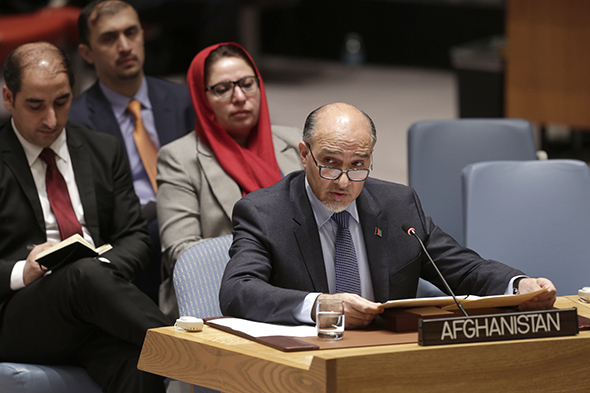 Taking this opportunity let me thank the Secretary-General for his recent report on the situation in Afghanistan. I would like to extend my sincere appreciation to Mr. Nicholas Haysom, Special Representative of the Secretary-General and head of UNAMA, and his team for their tireless efforts and hard work in Afghanistan, a reflection of which can be seen in the Secretary-General’s report. We recognize the importance of General Assembly resolution 68/11 and Security Council Resolution 2210 requesting the Secretary-General to report on the situation in Afghanistan every three months. These reports, which generally align with our insights on the realities in Afghanistan, provide a comprehensive account of daily developments in the country, covering a wide range of issues. 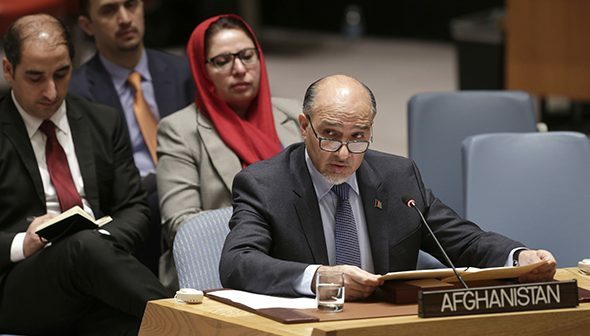 The Security Council’s quarterly deliberations on Afghanistan ensure that member states remain informed about the evolving security and socio-political dynamics in Afghanistan. It is also helpful for the National Unity Government of Afghanistan in its working relationship with the international community. In addition to immense wealth of information, the Secretary General’s quarterly reports identify problem areas relevant to the Security Council’s mandate. We hope the Council would take these debates a step forward and deliver relevant required actions for the problems raised. As we deliberate here today, the first post-transition year of Afghanistan is coming to an end. Despite some skepticism fuelled by extensive terrorist attacks this year and our high casualty rates, Afghanistan remains united with its national resolve against terrorism and violent extremism stronger than ever before. The National Unity Government has become an enduring phenomenon, spreading its wings over the governance of the country, aiming to be more inclusive through its outreach policies. 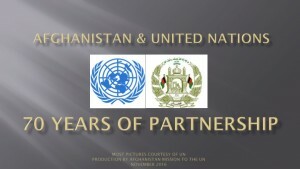 We are continuing our key goal of improving security through the overarching two-track policy of pursuing the peace process through regional and international efforts and increasing Afghanistan’s defensive capacity through national reform and Resolute Support Mission, in order to protect our people and keep the region and the world safe. Afghanistan is greatly appreciative of the continued support that the International Community has provided for our ongoing transition towards a stable, secure, and prosperous nation. Throughout the year, the National Unity Government continued its efforts to build trust, improve bilateral ties, and engage with the countries of the region to foster effective partnership. It invested considerable political capital towards the peace process. On December 9, through the Heart of Asia-Istanbul Process Ministerial Conference in Islamabad and the adoption of the UN General Assembly resolution “The Situation in Afghanistan” here in New York, the region and the world at large acknowledged that Afghanistan has been fighting regional and international terrorist groups. They recognized that a peace process backed by regional actors in particular Pakistan and supported by the international community, is essential for achieving long-term peace and stability in Afghanistan. The participants of Islamabad Conference recognized that “achieving peace and security is a shared responsibility in which each regional country must play its role”. They agreed to “put into practice specific measures necessary for countering and eliminating the menace of terrorism, curbing the spread of violent extremism and promotion of violence as a means of achieving political objectives”. They further agreed to take actions to deny terrorists’ access to financial and material resources, to dismantle their sanctuaries and training facilities, to curtail their ability to recruit and train, and to curb their movements. They urged all Afghan Taliban groups and all other armed opposition groups to enter into peace talks with the Afghan Government. They also resolved to begin the process of identifying and countering the threats associated with terrorism, transnational criminal narcotics, and weapon smuggling networks. The Conference decided to explore a collective security approach through adopting a common counter-terrorism strategy. It tasked the Heart of Asia relevant Senior Officials to meet in the first half of 2016 and come up with measures on security issues and counter terrorism. Along the margins of the Conference, during bilateral, trilateral, and quadrilateral meetings held between the Afghan President, Pakistani Prime Minister, Chinese Foreign Minister, and US Deputy Secretary of State, the parties stressed on the need for enhancing mutual trust and cooperation between Pakistan and Afghanistan. It was clear that friendly, mutually respectful relations between Afghanistan and Pakistan are necessary to create an enabling environment for the peace process and to ensure the security, stability, prosperity, and national interests of both states. We once again heard and welcomed the leadership of Pakistan’s statements, that Pakistan will play a genuine and constructive role in support of security, and facilitating peace talks with the Taliban. President Ghani hoped the Heart of Asia-Istanbul Process, in association with regional and international security organizations, could reach an agreement on a mechanism of verification of what type of actors threaten our common interests and how to deal with them in an effective manner. Talking to the Taliban is not new. We have been talking to them since they appeared in the political landscape of our country in 1994. We have experienced the seasonality and tactical use of war and peace. The latest potential diplomatic breakthrough in putting the peace process back on track and opening an effective and sustainable regional and global approach is a sign of hope, but can only become meaningful if words are translated to deeds. This is the moment of truth; we must see a genuine paradigm shift in the part of regional orchestrators of our insecurity. The recent attacks in Kandahar and Helmand provinces have shown that better relations with neighbors can only be possible when foreign based sanctuaries are dismantled and violence is reduced inside Afghanistan and across the region. Foreign planning, logistic support, safe havens, abundance of cash and deadly weapons, and suicide bombers are key enablers driving terrorism and violent extremism. The motivation for this level of support for terror within state circles, contrary to the Security Council Resolution 1373, must be questioned, identified, and addressed. In Afghanistan’s region, apart from other root causes of terrorism, states’ trust deficit and negative rivalry, fuming hate and excessive obsession and suspicion are causes of serious concern. Furthermore, tension between military and civilian control in domestic politics have instigated policies that use violence in pursuit of political objectives. This has turned our country into a theatre of proxy war for others and has provided a comfort zone within which terrorists and violent extremist groups operate at national, regional, and international levels. Targeting the promoters and drivers of such policies within the state structures through specific reform programs, especially in the security apparatus, as well as travel and financial sanctions would certainly make the world safer. We also hope the update and expansion of sanction regimes through resolutions 1267 and 1988 will further tighten the noose on the activities of Al-Qaeda, ISIS and the Taliban. The incursions of different kinds across the Durand Line continued throughout 2015, which are in clear violation of Article 2(4) of the UN Charter and UN resolution 2131. The flow of militant infiltrations and large-scale weapons smugglings in our region, providing manpower, firearms, and ammunitions to the terrorist networks must be disrupted. Deriding Afghanistan for its genuine concerns over the violation of UN Charter and resolutions is not helpful for any healthy dialogue. We expect better treatment for our concerns than routinely branding them “rhetoric from Kabul” or “blame game”. The rapid growth of Daeish or ISIS in Eastern and other parts of Afghanistan should be a serious concern for all of us. Some sections of the Taliban have sworn allegiance to ISIS. The recent inhumane attacks in California, Paris, Beirut, Nairobi, and the bombing of the Russian Airliner, have demonstrated how a new brand of terrorism has evolved into the leading global non-state terrorist actor, and can no longer be confined in the Middle East or our region. We need a unified response to strengthen global collaboration and develop strategies to denounce the extremist ideology of ISIS and their like, and combat terrorism in all its forms. Despite continued challenges, fifteen years of collaborative work and joint sacrifices of Afghanistan and the international community has had significant gains of which we should all be proud. Given the emerging challenges, today we fight the war of the world against international terrorism and violent extremism, with an average of 30-40 civilian causalities a day. The consolidation and sustainability of our gains are absolutely vital. The cost of an insecure Afghanistan and its consequences is far greater than a secure Afghanistan. Handling the fresh flow of Afghan refugees in Europe is a reminder of that. Removing the drivers of threats and making Afghanistan capable to defend itself and its citizen is in fact an investment in the safety of the world. The Afghan National Defense and Security Forces, better known as ANDSF, need sustainability and the right enablers to face the imposed war. We welcome the 1st December NATO decision to sustain its training mission in Afghanistan during 2016 and secure funding for ANDSF until the end of 2020 and look forward to the 2016 Warsaw NATO Summit deliberation on Afghanistan. 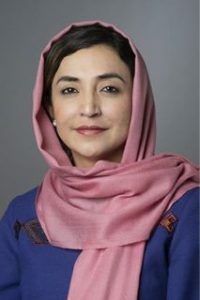 Beside the security challenges, the National Unity Government of Afghanistan has remained focused on economic issues, in particular addressing the fiscal gap, poverty, unemployment and delivery of basic services, through a series of initiatives within the Self-reliance through Mutual Accountability Framework (SMAF) and in line with 2030 Agenda. Our efforts in the promotion and advancement of regional economic cooperation within the RECCA Process have already yielded results. The recent start of construction of TAPI gas pipeline, our accession to WTO and establishment of a series of Special Economic Zones in the country as part of Afghanistan’s economic development plan are great news for our people, our partners in the region, and around the world. Our Self-reliance reform plan needs effective use of development aid and increase in national revenue. We look forward to discuss our more vigorous programs with the international community during the 2016 Brussels international conference on Afghanistan. The relevant actors in our region should realize that they can benefit from the peace dividend of Afghanistan. We are diligently working to strengthen good governance and the rule of law; protect and promote the rights of all Afghans, and enhance the fight against narcotics. In this effort, we are enhancing the internal capabilities of our nation. We are making progress in the restoration of credibility in the electoral process. We have already begun to implement the recommendations of the Special Electoral Reform Commission. In conclusion, I would like to reiterate that despite constant attacks on our sovereignty and people, Afghanistan stands strong and united in the face of terror. We will not be defeated by extremist elements who want to destroy the progress that we have collectively achieved since 2001. We have demonstrated time and again that we are willing and committed to work on the road towards peace. Currently, extremism worldwide threatens our core values and aims to divide us. Afghanistan is fighting terrorist threats every day, and we expect stronger global partnership to holistically address the root causes of such activities. We must ensure that the voice of reason prevails and we must present a unified front against terrorism, in all its aspects and wherever it exist. In this regard, we are very grateful for your unconditional support in the past, and look forward to a fruitful and effective relationship in the future to create a world of justice and peace. I would like to take this opportunity to pay tribute to the courageous men and women of so many nations that have served, and sacrificed their lives alongside their Afghan comrades and partners, in combating terrorism and seeking a better future for the people of Afghanistan. We shall best honor their courage and memory by finishing our task at hand. We also extend our heartfelt condolences to the families of those civilians who tragically lost their lives during the recent barbaric attacks by Daesh, in various parts of the world. As a new representative of a transformed Afghanistan with a strong popular mandate and high expectations from the United Nations, I hope this noble Council could continue to act on the plight of millions of my people who have seen nearly four decades of imposed conflicts. Let us therefore reaffirm our longstanding commitment to ensure an Afghanistan that stands in peace and security, for its implications are by all accounts far-reaching and essential for global peace and security.